When I learned that Idaho Potatoes would be sponsoring our Passover Potluck, I was thrilled. I adore potatoes– they’re kosher for Passover, gluten free, all natural– and I can always count on Idaho Potatoes for a quality product. According to their website, “Idaho’s warm days and cool nights, ample mountain-fed irrigation, and rich volcanic soil give Idaho Potatoes their unique texture, taste and dependable performance.” Russet potatoes are grown in many states, but only Idaho Potatoes have the “Grown in Idaho” seal. Look for it to ensure you’re getting real Idaho potatoes! I developed this Passover recipe for Idaho Potatoes as part of our online Passover Potluck. It’s something I experimented with over New Years, when I wanted to make a special meal for my hubby. We shared this gratin with a glass of wine to kick off 2013. The first time I made it I fried the potatoes, but I realized that they soaked up a lot of oil during the process. Here, I’ve roasted the potatoes with a little olive oil and paprika for fabulous, fluffy results– crispy outside, soft and steamy inside. 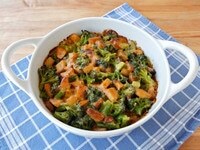 I combined them with lightly steamed broccoli, then poured a sharp cheddar sauce over the top and baked. The result was beyond delicious. It’s a terrific side dish for a dairy meal; it could even act as an entree. It’s a Passover-friendly alternative to broccoli mac and cheese. You’ll love it! Yummy gratin made with roasted Idaho® Potatoes, broccoli and sharp cheddar cheese. A delicious vegetarian entree or side. Kosher for Passover. 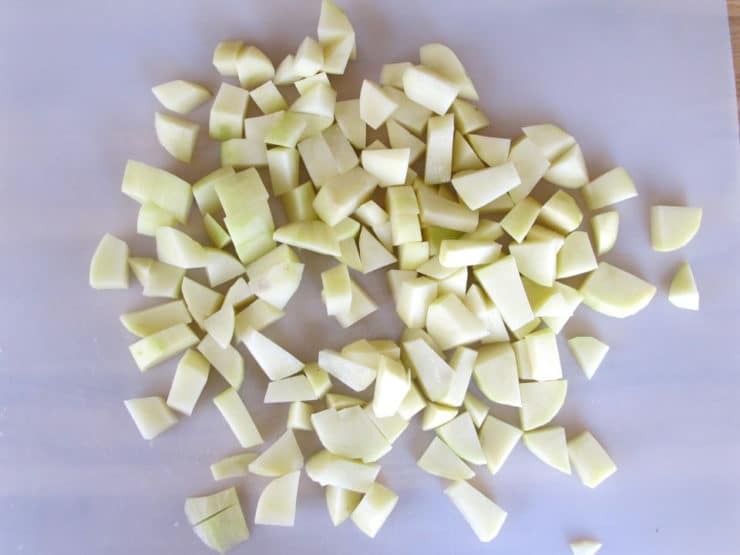 Place a rack in the middle of the oven and preheat to 425° F. Slice the peeled potatoes into ¾ inch pieces. 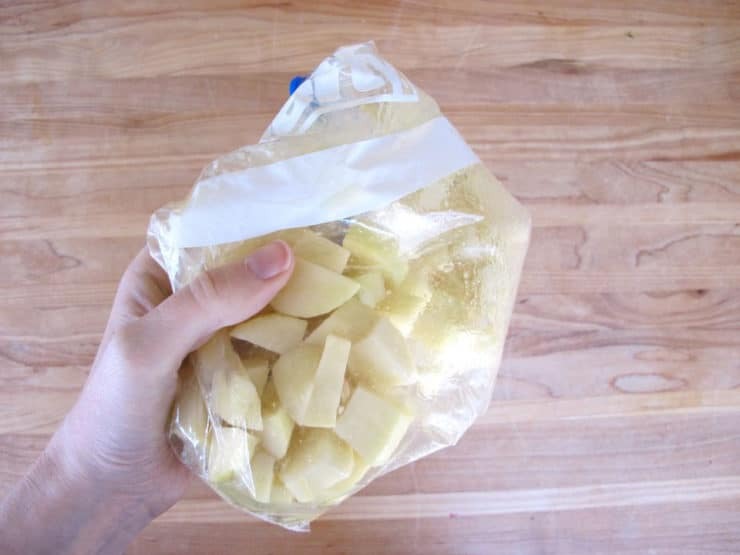 Place the potato pieces into a gallon-sized plastic zipper bag with olive oil. Close the bag and toss the potatoes well. Work the potatoes with your fingers for a minute so all the potato pieces are lightly covered with oil. 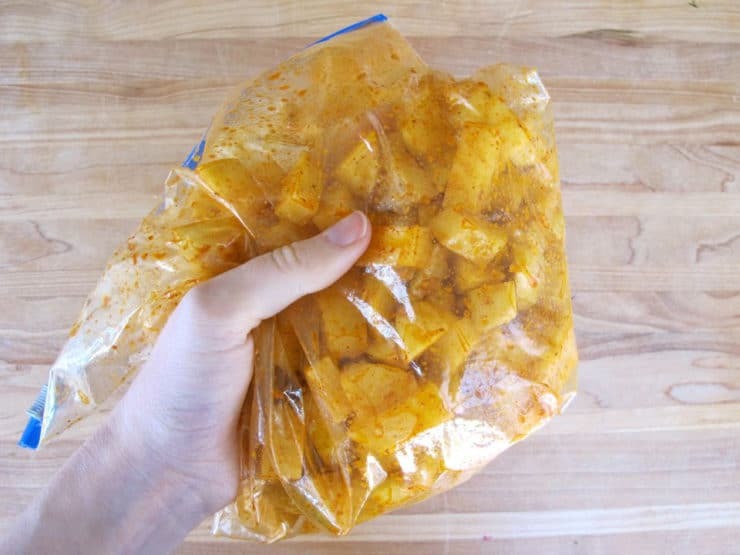 Open the bag and sprinkle in the garlic, paprika, ½ tsp salt and a pinch of black pepper. Close the bag, then shake and massage the potato pieces for a minute or two so that all the pieces are evenly coated with seasoning. 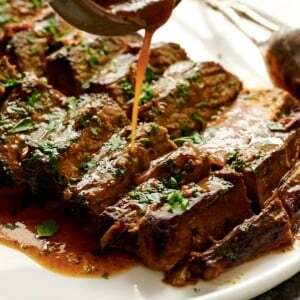 Generously grease a baking sheet with nonstick cooking spray or olive oil. Spread potatoes out in an even layer onto the sheet. 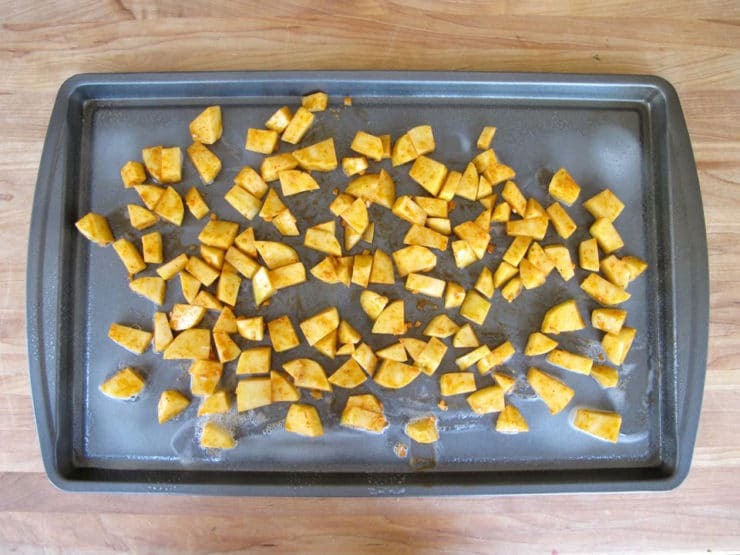 Place the baking sheet into the preheated oven and let the potatoes roast for about 20 minutes, stirring once halfway through cooking, till the potato pieces are browned, crisp and cooked through. 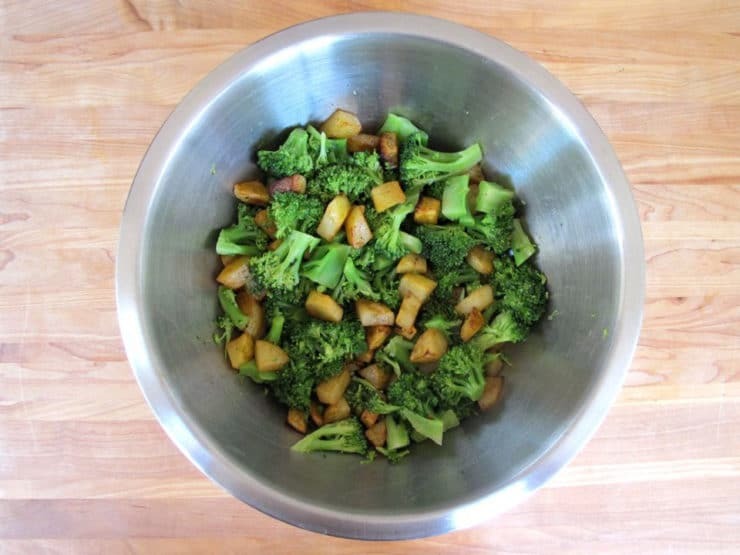 Remove cooked potatoes from oven and reduce oven temperature to 375° F.
Clean the broccoli and cut into small florets. In a medium saucepan, bring 1/2 inch water to a boil. 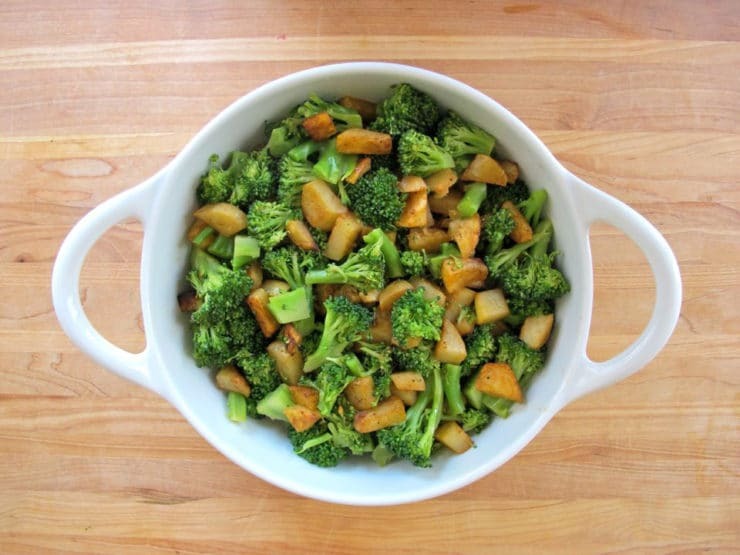 Place broccoli florets in the pan and cover with a lid. Let the broccoli steam for 3-4 minutes till bright green and tender. Pour broccoli into a colander and rinse with cold water to stop the cooking process. Shake broccoli, then pat dry to remove excess water. Rinse the saucepan. Place broccoli into a large mixing bowl. Add the roasted potato pieces. Toss to mix. Lightly grease your gratin dish or baking dish with olive oil or nonstick cooking oil spray. Pour the mixed vegetables into the dish. 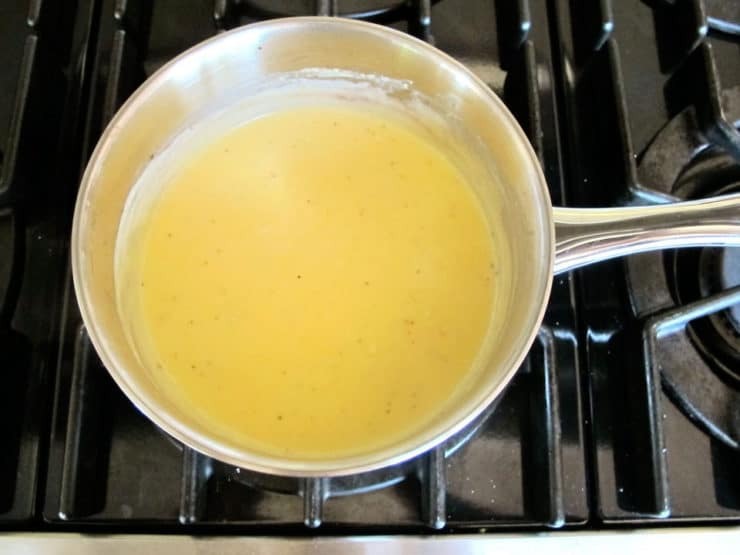 In the rinsed saucepan, melt 1 tbsp butter. Whisk in 2 tbsp potato starch. 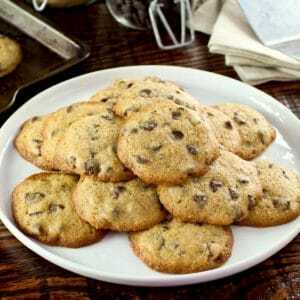 Add milk slowly, ¼ cup at time, whisking frequently, till it thickens and begins to bubble around the edges. Whisk in the grated cheddar cheese and stir till melted and smooth. Whisk in ½ tsp salt and ¼ tsp pepper. 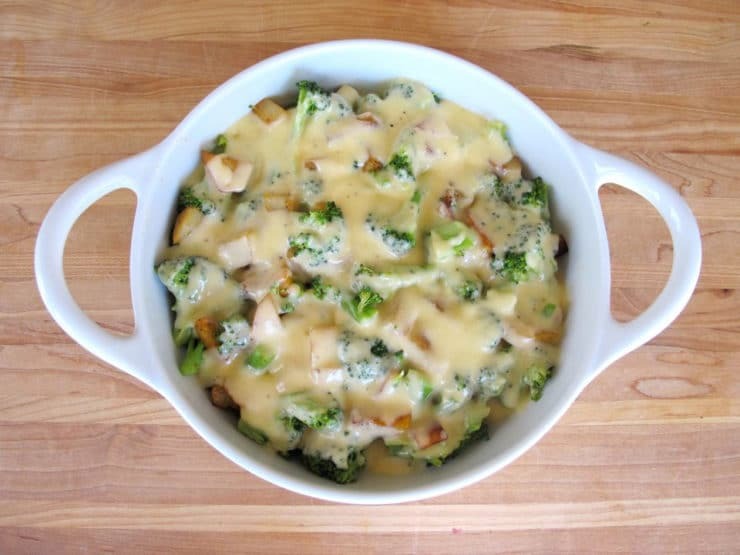 Pour the cheese sauce evenly across the top of the broccoli and potato pieces.Place the assembled gratin into the oven and bake for 20-30 minutes till edges begin to brown and the cheese sauce is bubbly. Remove the gratin from the oven and turn on your broiler. When broiler is hot, place the gratin back in the oven and let it brown under the broiler for 1-2 minutes, watching it carefully, till the top is browned to your liking. Serve hot. Hey Tori! I’m making this for Rosh Hashanah since it is a family favorite. Can I make in advance and reheat? Thanks! Hi Marissa! You can make it all ahead, but for best results I recommend making ahead through step 8 (assembling the vegetables), then cover and refrigerate. Just before you cook it, make the sauce (it only takes 5 minutes or so), pour over, and bake. It will taste even better this way. Enjoy! Hi! We love your recipes and wanted to make it for Passover but noticed the ingredient list has 2 tsps of potato starch while the steps say 2 tablespoons. Which is the right amount? Thank you! Hi Tiffany! The recipe was recently transferred over to a new system which is why there is an error in the amount. It’s 2 tablespoons. This is a great idea. It had inspired me to do a broccoli and potato kugel for the high holidays. Toda! Where can I find potato starch? 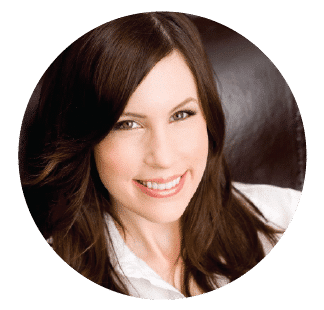 Hi Margie, the kosher section of your grocery store or a local kosher market will carry potato starch. If you’re not keeping kosher for Passover, feel free to use 1 tbsp cornstarch as a substitute. This is the best vegi-Passover recipe for my family that I have ever found online. Jealous I didn’t think of it first! Cannot wait to try it! Oh Tori, I am ready for the Potluck for sure now. What a great recipe to start off the festivities!